Unai Emery sent a congratulatory message to Arsenal target Steven N’Zonzi on Sunday after the midfielder’s side France won the World Cup, beating Croatia 4-2 in the final. 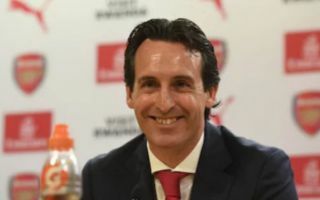 The Gunners have been keen on signing the Sevilla midfielder this summer according to Le10Sport, and Emery’s tweet this evening following the World Cup final is one that could very well be seen by some as a tactic to try and get the Frenchman to the Emirates this summer. The north London side have been crying out for a solid defensive midfielders ever since Patrick Vieira left the club, and N’Zonzi could very well be that man if the Gunners get their way this summer. The former Blackburn and Stoke star has been a key part of Sevilla’s side this year, helping the club secure a sixth-placed finish in La Liga and reach the Copa Del Rey final, and he of course shone under Emery during his time as manager of the club. Clearly still in touch to some degree, Emery mentioned N’Zonzi as among a number of players he congratulated in his tweet after the World Cup final, including some of his former Paris Saint-Germain players Kylian Mbappe and Presnel Kimpembe. Despite his displays with Sevilla, N’Zonzi was mainly made to watch from the bench this summer as his side won their second World Cup trophy in the last 20 years, though he came off the bench to replace N’Golo Kante in today’s final. With players such as Granit Xhaka and Mohamed Elneny failing to perform the role of defensive midfielder adequately during their time in north London, N’Zonzi could be the player that Emery’s side need to complete their midfield for next season.